In celebration of our 15th year, we are very pleased to announce a new partnership with Unite to Light, a non-profit organization dedicated to providing low-cost solar lighting to global communities without electricity. 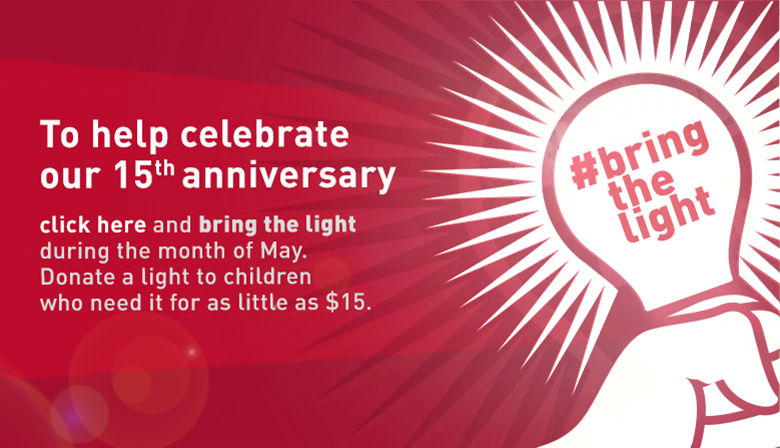 As part of our 15th anniversary celebration, we have teamed up with Unite to Light in a campaign we’re calling Bring the Light. Our hope is for Light Reading to be a place you can come for inspiration and guidance as you plan your next lighting project. The thing is, we are incredibly inspired by our readers! Your creative installations, kind words, and contributions to product Q&A’s constantly remind us why we do what we do. In this season of thankfulness, we are so thankful for you. We are looking forward to continuing to share lighting information and photos with you in 2014! As always, let us know if you have any special requests for blog topics below. Download Your Free Under Cabinet Lighting Guide Today! What could make your experience with under cabinet lights better? That’s the question the experts at Pegasus Lighting have been asking for years. We’ve written numerous blog posts on the subject, created video guides, and hand-picked every under cabinet fixture on our website – always with quality, affordability, and ease of operation in mind. And yet, we wanted to do more. 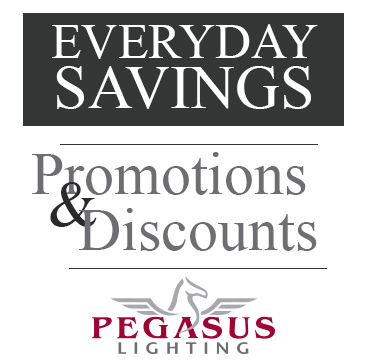 Today, the lighting experts at Pegasus have achieved that goal. It’s called “The Complete Guide To Under Cabinet Lighting,” and you can download it for free, in the format of your choice, right here on our website. Why do I need under cabinet lights? What kind of lights will work best for my needs, my space, and my tastes? What should I expect from my lights over time? Happy Earth Day from everyone here at Pegasus Lighting! If you’re a regular here on the blog, or if you’ve browsed around on our website, you know we’re big fans of energy-efficient, “green” lighting. We strive to stay up-to-date on the latest eco-friendly news and innovations, and to always provide you, dear readers, with quality green lighting products and helpful energy-saving tips. But we can’t do it alone! We follow a group of expert bloggers and industry leaders to help us in our quest to make sustainability accessible for all. Fresh Energy: Fresh Energy is a non-profit organization that’s been around for over 20 years – so you know they know what they’re talking about. Their main goal is to promote smart energy policy concentrating on areas like clean energy, energy-efficiency, climate change, and eco-friendly transportation and building. Green Upgrader: Green Upgrader is one of our favorite green lifestyle blogs, eager to show all readers that even small eco-friendly changes can make a big impact! We love them for their constant eye on sustainability news, and mass of green how-tos, but they also offer neat things like ideas for sustainable cooking and eco-friendly entertainment options (think low-impact board games and the like). EarthTechling: EarthTechling, run by a group of technologist-meets-environmentalists, is committed to reporting on technological advancements that could change the world for the better. They cover everything from simple how-to guides about saving energy around the house to breaking news regarding new gadgets, appliances, and technological upgrades. Do You Subscribe To Light Reading With Google Reader? If the news that Google Reader’s days are numbered has totally rocked your world, don’t stress! You can still keep up with all the good stuff happening here on Light Reading. Here’s a bright idea: You can easily subscribe to our blog via email. Just type your email address in the box to the right and click subscribe! It’s just that simple. I promise you we’ll never sell, rent, or lend your email address to anyone, ever. You’ll just get a tidy little notification when we post something new to the blog (about 4 times a week). Never again will you risk losing touch with us (unless you choose to). You can use Google Takeout to get a copy of all your Reader data, and migrate it to a new service. To find your next RSS reader, check out this article from Marketing Land: 12 Google Reader Alternatives. Thanks to all you wonderful individuals for your continued support and interest in Light Reading! And if you don’t already subscribe to Light Reading, why not start now? Yesterday, Rosemary Ellis of Good Housekeeping was on the TODAY Show to reveal 9 of 2013’s most innovative consumer products. And guess what! One of our very own products made the cut! Out of more than 1,500 different products, Good Housekeeping chose the Mr. Beams ReadyBright Power Outage Lighting System as one of their favorite products. “We think everybody should have one of these,” said Ellis.